Conveniently located between West Virginia's Hatfield McCoy Trails and The Spearhead Trails of Southwest Virginia, The Real McCoy Cabins are the premier vacation destination for the off-road enthusiast. We have six luxury cabins, five capable of sleeping six guests, one ADA cabin capable of sleeping four guests, all with a full private bathroom and kitchenette included. Feel free to book your reservation online by clicking the link below, by phone (276)945-3106 or you can reach out via E-mail and we will get you set-up in no time. 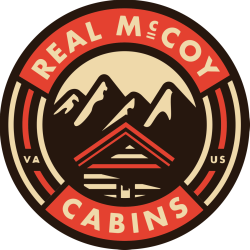 Thank you for checking out the Real McCoy Cabins! If you're interested in booking a stay with us, we would be more than happy to accommodate you.